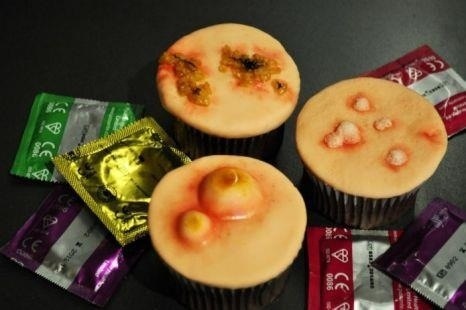 STD Cupcakes is not a weird euphemism for the actual thing. They are the kooky creative masterpieces from Eat Your Heart Out, a pop up shop in London at the Saint Bartholomew Hospital. These cupcakes will be on sale to celebrate the Halloween season. The hospital will also host informative lectures to discuss the featured diseased desserts. Other infectious confections include lung cancer and toenail fungus cookies and polycystic kidney cakes. Yum. This is the only time it will be remotely appropriate to purchase a chlamydia cake. « Where would you go, if you could go anywhere? What would you do, if you could do anything?